For over 75 years, Rayne Water has been one of the industry leaders in the development and improvement of water softeners and drinking water filters. These products and services are all of only the highest quality and offer the greatest savings and values while being among the most environmentally safe in the industry while working to protect our Santa Clara River. Serving the Santa Clarita Valley since 1964, Rayne has been providing local residents with industry-leading service and quality to residential and commercial locations alike throughout all of Southern California. Hard water can leave you using excess detergent to attempt to clean the spots that accumulate on your glasses, dishware, and silverware as well as forcing you to use additional shampoo and cleaners to try and eliminate the dry, itchy feeling in you hair and skin after your shower as well as cleaning the spots that form in your shower itself. Soft water can help to reduce the amount of detergents, cleaners, and shampoos you will need to keep your skin, hair, and kitchenware looking and feeling as great as ever. Rayne Water has been providing these services and more to the Santa Clarita Valley for nearly 50 years all of which are environmentally approved methods to help preserve our natural water sources and local ecosystems. Rayne offers both Water Filtration systems and Water Softeners, boasting dozens of differents products and services to insure they can best provide you with exactly the system you will need, ranging from services that cover your kitchen sink all the way up to your entire home or business. All of Rayne Water’s products and services boast a Water Quality Association (WQA) Gold Seal ensuring that they are held to the highest standards in the industry. This allows them to offer industry leading warranties for all products and services, also all Rayne products and systems will only be maintained and serviced by their highly trained and experienced technicians. 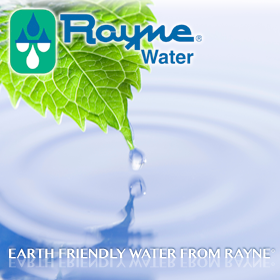 Rayne’s commitment to the environment is just as important as their commitment to their customers by offering bottled water quality water to all of the Santa Clarita Valley without the need for plastic water bottles saving the local landfills and ecosystems from tons of plastic waste, also by offering industry leading efficiency to use less water and salt in the regeneration process. Rayne Water pledges to obey all governing laws, fulfill all obligations to their vendors and customers, be a leading corporate citizen in all areas they operate, employ only those with exceptional ethics and customer service skills, and to guarantee the excellence of all of their products and services.